This game was created with Torque v1.5 from GarageGames. Watch the Gameplay Video on YouTube. Please email me at jorkin@alum.mit.edu with any problems, or see our System Requirements and Troubleshooting page. The Restaurant Game takes about 10 minutes to play. It is a two-player game that will automatically find partners for players once you join a server. You are welcome encouraged to play multiple times. In order for this project to be at all successful, we will need to collect a lot of data -- data from over 1,000 10,000 gameplay sessions. Play early, play often, and please spread the word! Please email me at jorkin@alum.mit.edu with questions or technical problems. 10,027 games played as of 09/08/10. After capturing over 1,000 games in the first two weeks, we have raised our goal to 10,000 games. Jeff Orkin, Tynan Smith, and Deb Roy. (2010) Behavior Compilation for AI in Games. Proceedings of the 6th Artificial Intelligence for Interactive Digital Entertainment Conference (AIIDE), Palo Alto, CA. Jeff Orkin, Tynan Smith, Hilke Reckman, and Deb Roy. 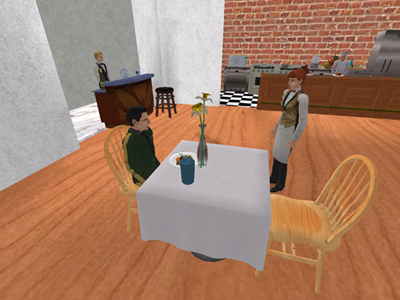 (2010) Semi-Automatic Task Recognition for Interactive Narratives with EAT & RUN. Proceedings of the 3rd Intelligent Narrative Technologies Workshop at the 5th International Conference on Foundations of Digital Games (FDG), Monterey, CA. Hilke Reckman, Jeff Orkin and Deb Roy. (2010) Learning meanings of words and constructions, grounded in a virtual game. Proceedings of the 10th Conference on Natural Language Processing (KONVENS), Saarbrücken, Germany. Jeff Orkin and Deb Roy. (2010) Semi-Automated Dialogue Act Classification for Situated Social Agents in Games. Proceedings of the Agents for Games & Simulations Workshop at the 9th International Conference on Autonomous Agents and Multiagent Systems (AAMAS), Toronto, Canada. Jeff Orkin and Deb Roy. (2009) Automatic Learning and Generation of Social Behavior from Collective Human Gameplay. Proceedings of the 8th International Conference on Autonomous Agents and Multiagent Systems (AAMAS), Budapest, Hungary. Jeff Orkin and Deb Roy. (2007) The Restaurant Game: Learning Social Behavior and Language from Thousands of Players Online. Journal of Game Development, 3(1), 39-60. Jeff Orkin. (2007) Learning Plan Networks in Conversational Video Games. Masters Thesis, MIT Media Lab.